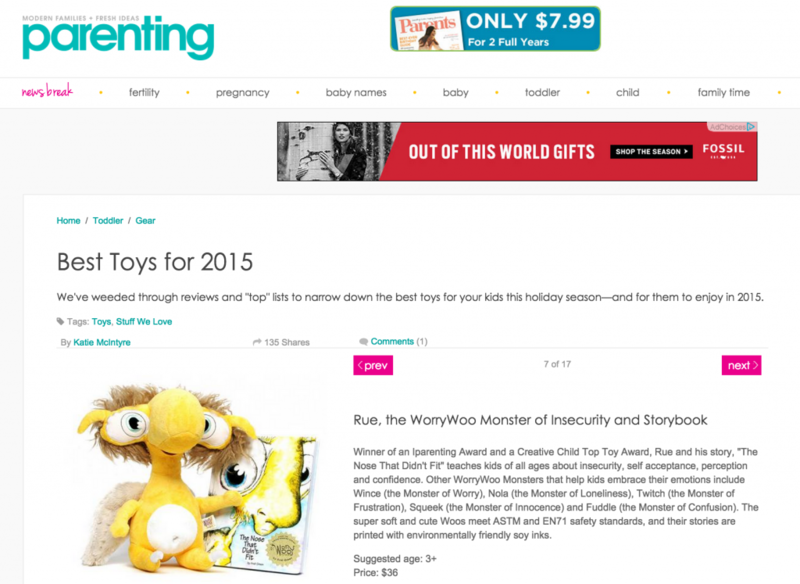 Congratulations to our Client WorryWoo Monsters for their feature on Parenting.comÂ as one of the Best Toys for 2015! Helping children understand and express their emotions can be a caregiver’s biggest challenge. Make the job easier with help from a WooryWoo Monster–loveable stuffed animals which show children that’s okay to feel the way they do. Andi Green is the celebrated illustrator of theÂ WorryWoo Monsters–a cast of lovable characters that assist kids with recognizing and coping with difficult emotions and situations. Inspired by her own insecurities and roadblocks growing up, Green created the WorryWoo Monsters to teach other children how to dig deep and find their own confidence. Through a line of plush toys and illustrated storybooks, as well as a partnership with renowned Australian child psychologist Dr. John Irvine, they’ve struck a chord with countless children around the world. Winner of an Iparenting Award and a Creative Child Top Toy Award, Rue and his story, “The Nose That Didn’t Fit” teaches kids of all ages about insecurity, self acceptance, perception and confidence. Other WorryWoo Monsters that help kids embrace their emotions include Wince (the Monster of Worry), Nola (the Monster of Loneliness), Twitch (the Monster of Frustration), Squeek (the Monster of Innocence) and Fuddle (the Monster of Confusion). The super soft and cute Woos meet ASTM and EN71 safety standards, and their stories are printed with environmentally friendly soy inks. Check them out at worrywoos.com!